‘In July Change4Life is launching the really big summer adventure, an exciting, high-profile campaign to inspire children and their families to get active over the summer holidays. Win 2000 Sainsbury’s Active Kids vouchers! Win 2000 Sainsbury’s Active Kids vouchers! Thanks to our partnership with Sainsbury’s, schools have got the chance to win 2000 vouchers to boost their Active Kids Account. Lloyds TSB National School Sport Week 2011: 27 June-1 July – FOUR weeks to go! 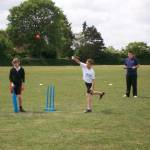 Are your schools planning a sports day this summer? 2012 Olympic Games Tickets for Schools Schools can claim their tickets to the Games now!